Students, Landon Jennings, Ryan Young, Elissa Hill, and Kiana McCue, participate in a beach cleanup on Mustang Island State Park. These 5th grade student are members of the Intermediate Nature Club at Flour Bluff Independent School District. 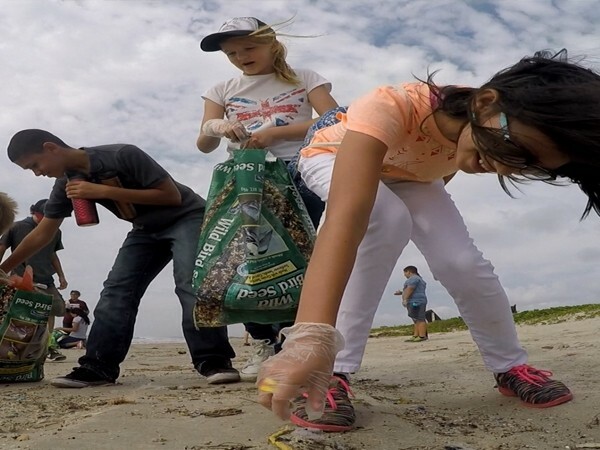 Photo Credit: Jace Tunnell, UTMSI.Mission-Aransas Reserve strives to teach 5th and 6th grade students about the impact of beach debris on the South Texas marine environment. Education takes on a new twist as students turn beach trash into a visual treat, making learning fun. Students from the Flour Bluff Intermediate School are working with the Reserve to learn about marine debris, participate in a beach clean-up event, and to create artwork from some of their “treasures” to be displayed this fall at the Corpus Christi Dia de los Muertos Festival. Through this creative process students are learning about what type of trash is common to our Texas beaches. The Reserve even sneaks in a bit of scientific method and sampling into the lesson. Students will be transforming their views about this beach trash into creative art and displaying it as a means to visually educate their fellow citizens. This project is funded by the Texas General Land Office, and the National Oceanic and Atmospheric Administration to help future generations understand that they can make a difference in reducing trash on Texas beaches.